The mighty Grand Canyon is one the world’s seven natural wonders, but with almost 5 million annual visitors, it can be hard to escape the crowds. 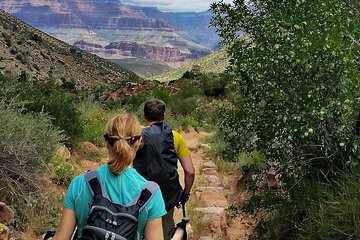 This private full-day tour will take you along the South Rim, where you can get back to nature on a scenic hike, then tuck into delicious picnic lunch (included) overlooking the canyon. Begin your day with pickup from your Flagstaff hotel by private vehicle and soak up the scenery on the 1-hour drive to the Grand Canyon. On arrival at the South Rim, follow your guide on a thrilling hike around the edge of the canyon. There is a network of short to medium length hikes to choose from, ranging from easy 1-mile (1.6km) nature trails to more challenging 10-mile (16km) routes, offering spectacular views over the canyon. Along the way, learn more about the natural wonder from your guide, explore fascinating Native-American ruins, and take the opportunity to admire the landscape through a high-powered spotting scope. Finish your experience tucking into a delicious picnic lunch overlooking the mighty canyon. Travel back through Navajo land on the return journey to Flagstaff, where you’ll have chance to learn more about the region’s history and stop at a Navajo trading post (optional). Your tour ends with a drop-off back at your Flagstaff hotel.